Four "eco-towns" due to be built in England are to receive a funding boost of £60m to be spread over the next two years, the government has announced. The towns, which were whittled down from a shortlisted 12 last year, are Whitehill-Bordon in Hampshire, St Austell in Cornwall, Rackheath in Norfolk and North West Bicester in Oxfordshire. Each is set to receive just over £9m for the next financial year from the Department for Communities and Local Government and the Homes and Communities Agency (HCA), with an additional £2-6m earmarked for 2010/2011. The Department for Schools, Education and Families has also agreed to ring-fence £2.5m to spend on "greener schools". These locations could house up to 30,000 people in eco-friendly dwellings in five years' time. There are plans to build up to 5,500 homes on this Ministry of Defence-owned site situated west of Whitehill-Bordon. In an area where more than 2,700 people are on the waiting list for affordable housing, the proposals could eventually lead to the building of 2,000 affordable homes. Between 70 and 200 "eco-homes" are set to be built on the site first, while low interest loans will be given to those already living there so they can adapt their homes and make them more affordable to run. The plans for Whitehill-Bordon include training people in "green technologies"
Construction is due to begin on an "eco-station", which will be made from an out-of-use fire station and run by a boiler powered by biomass (fuel derived from living or recently-living animals and plants). It will host exhibitions and provide training facilities for the community. The developers plan to turn Whitehill-Bordon into an area where the range of creatures and plant life will be enough to attract visitors away from protected conservation areas under risk nearby. The town library and local primary schools will be fitted with energy saving features, while the developers will examine how feasible it is to use the local woodland and forestry as a source for up to 5,000 tonnes of fuel. This site has already begun hiring "green collar" workers who are experts in biodiversity and home energy, while Hampshire Council will be recruiting people to carry out "low-carbon" work. The developers have said they want to create 7,000 jobs while building the town. Government money will also be used to fund improvements to public transport, installing electric car charging points and a feasibility study on re-opening a rail link. But the plans have not been welcomed by all. The Bordon Area Action Group has made clear its members are concerned at issues related to building on greenfield land, the scale of the proposals and the number of people the developers hope to attract to the site. The second project to get the go-ahead is a development of about 5,000 homes on former china clay workings, industrial land and disused mines near St Austell in Cornwall. The land is no longer needed by owner Imerys and the initial proposals looked at building 1,500 affordable homes in an area where more than 5,000 people are on the affordable housing waiting list. Some of the central government funding will pay for an initial 37 affordable environmentally friendly show homes in the town centre, while there will also be a focus on educating the local community on how best to carry out sustainable construction in the area. The Eden Project, a giant environmental centre nearby, is to team up with the developers to run a community hub. It will showcase new environment technologies and provide educational projects for the community. There is also a plan to fit 10 properties with alternative, "eco-friendly" technologies and at the same time the builders are expected to use up to 30% less carbon than normal. These homes will be monitored via smart meters which will provide detailed accounts about how much energy they use. This development will also see a new bus station where the emphasis will be on "green transport", with the inclusion of electric bike charging points. The council estimates at least 500 trainee jobs will be created during the building of the town. Critics had previously said the St Austell site could have a problem with transport links. The North West Bicester proposal is for an eco-town with 5,000 homes in an area where more than 7,000 people are on the waiting list for affordable housing. The eco-town would provide at least 1,500 affordable homes. Although not all details have yet been thrashed out, the government funding will pay for up to 200 pilot "eco-homes". The success of these will be used to figure out how to create the most efficient homes for the rest of the project. They will be heated by renewable energy sources. Work is due to begin on creating 30 affordable homes in the town centre next month, while many properties in the town are due to be fitted with a variety of devices to make them more energy efficient and give them better insulation. There are also plans for the sixth form Cooper School in Bicester to be given a solar roof, ground source heat pumps which use pipes buried under the earth to extract heat from the ground, and triple glazing. The proposals to improve the public transport in the area include a pedestrian-only path from Bicester North station to the town centre and extended bus routes. 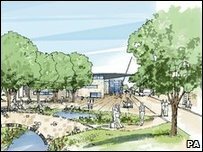 Councillor Michael Gibbard, council member for planning and housing, said: "This money will help us turn our aspirations for Bicester into a reality. 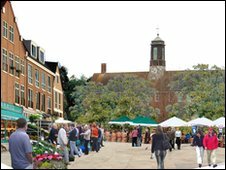 However critics, including Tony Ives, the chairman of the organisation Bicester and Villages Against Sham Eco-town (Base), have previously argued the eco-town was being forced through contrary to the local development plan. They are considering going to court to find out how legal the towns will be. The fourth project to be given funding by the government will lead to the building of 6,000 homes on the north-east edge of Norwich. The developers hope to build 1,800 affordable homes in an area where more than 12,000 people are on the affordable housing waiting list. All the new homes will be built to environmental standards, and will incorporate rainwater re-cycling, low flush toilets, high insulation levels and environmentally-friendly roofs. There are plans to build an initial 200 eco-homes showing the different types of houses and technologies possible. Next month, 12 extra demonstration homes will be built in Rackheath which will showcase energy efficiency schemes for residential properties. There is also a plan to build a demonstration biomass-fuelled combined heat and power plant which could sell electricity back to the grid. Resident who use very little energy may be able to partake in a pioneering personal carbon trading scheme while others can also apply for grants to help make their homes more carbon-neutral. The grant will have to be paid back when their houses are sold. Rackheath will also team up with the Environment Agency to look at how to create a sustainable water strategy for supplying the local community. However, the decision to make Rackheath an eco-town follows opposition from villagers who had marched, petitioned, written to MPs and held meetings to raise their concerns.